"A truly great preacher isn't someone with a seminary degree who explains the gospel; it's someone who is the gospel." 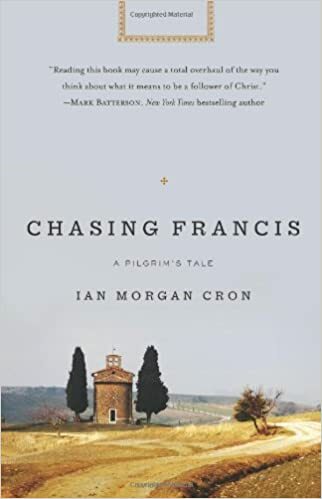 Last week I read Ian Morgan Cron's Chasing Francis: A Pilgrim's Tale. I've had it on my Amazon wishlist for several months, though I can honestly say I'm not sure why. I don't remember who recommended it or where I stumbled onto the title. But when I saw it on the bargain book table at a local Christian bookstore, I picked it up. And I'm infinitely grateful that I did. Cron weaves a story that is so similar to my own. 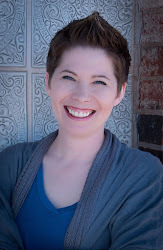 Our family attended Pentacostal and non-denominational churches throughout my years at home. As an adult, I settled into that routine as well. But in recent years, I've felt my heart aching for something...different? Better? I haven't been able to put into words exactly what I've been looking for, or what I thought was missing. Until I read this book. It's a work of fiction, and yet pulls in historical and spiritual truths that touched my heart in ways I'd forgotten about...truthfully, it stirred me to know Jesus more. As I read, I was asking myself, "Why don't I take you seriously, Jesus? Why do I believe Christian celebrities when they say, 'This is what Jesus said, but he didn't really mean that. You don't really have to sell your belongings and give them to the poor. You don't really have to be poor in spirit, hunger and thirst for righteousness, or be meek to inherit the kingdom.' Why do I believe them over you? Because it's convenient?" We're all seeking God together --come join us.....If someone asks me what kind of church I belong to, I want to say, 'a come and see church.' Come and see how we love the poor; come and see how we give dignity back to those who've lost it or given it away; come and see how we encounter God through every practice at our disposal; come and see how we love one another in community; come and see how we stand for peace and justice; come and see how we've been freed from consumerism and have become radically generous; come and see our passion for beauty; come and see how we defend the earth; come and see how we preach the gospel at all times and when necessary use words. Come and see--and perhaps after a while, you'll decide to join us in the story we're living in. That passage really sparked a passion in my heart. As I said, I've felt this longing for something within the Church, but couldn't put language to it for the longest time. This was the language I needed. It helped me define what it is I've been seeking. See, I want to be a part of a faith community that identifies more with their Savior than with a political party. I want to be part of a faith community that reclaims the Arts, instead of relegating them to the realm of the secular. I want to be part of a faith community that embraces our call to be caretakers of creation. I want to be part of a faith community that embraces the disenfranchised and brings them in as family. More importantly, I want to BE that church. I don't just want to be in a church where others believe those things, I want to honor those values in my own heart, in my own home. Not to sound cliche, but I want to BE the change I wish to see within the Body of Christ, and ultimately, the world. While I needed language, I gained more than that...I feel like I got a road map. I love books that point me back to Jesus, that show me more of his character, his passion, his vision. And Chasing Francis did that for me. What have you read lately that was a wake up call? Please share...I'd love to hear!